Nowadays, technology eases household chore burdens especially cleaning houses more than ever by releasing a series of robotic vacuum cleaners. However, among hundred thousands of products, it is hard to find which the best one is. It is undeniable that models from iRobot are of the greatest ones in the market today. And Roomba i7 as well as Roomba 980 is the products that you should miss. This review is going to see how similar and different these devices are when they are compared to each other. With iRobot HOME App, it becomes simple to clean, make a schedule and choose your favorable cleaning mode through a smartphone. Equipped with iAdapt 2.0, Roomba 980 can navigate different areas in your house exactly. The run time is up to 2 hours, it can recharge automatically. AeroForce Cleaning System together with 10x air power make deep and hard-to-pull dirt be removed from your floors. It will bring the great performance on the carpets thanks to Power Boost. You can supervise the cleaning process around your house via Clean Map reports. With High Efficiency Filter, it is believed to remove more than 90% debris and tiny particles as well. The apps which allow their users control by voice can also assist you in controlling your vacuuming machine. Smart sensors will control your Roomba 980 to move flexibly under your chair. Roomba i7 make dirt and dust on your floor uncomfortable with Power Lifting Suction that is able to bring 10x air power with intention of making the best performance. With Patented iAdapt 3.0 Navigation with vSLAM technology, the device will remember where it has cleaned or not. Smart Mapping technology makes it easy for robotic vacuum cleaner adjust to your house in short time. This modern tech also helps the device select the best effective method to vacuum the house according to the structure of your house and the arrangement of furniture. Being upgraded to Premium 3-stage Cleaning System, it is capable of removing pet hair and debris that you can see or not. So, if you are owners of pets and are worrying about the huge amount of pet hair every day, it is time for you to relax. With rubber dual brushes, it can run smoothly on various types of floors to collect dirt and dust. Similarly to Roomba 980, you can clean your house without a touch on your vacuum cleaner via many apps available on your phone. Edge-Sweeping Brush, Auto-Adjust Cleaning Head, Patented Dirt Detect Technology are also common features from models made by iRobot. We have gone through some brief information about Roomba 980 and Roomba i7. Now, can you guess what are similarities between the above machines? It is easy to see that both of them can be conveniently controlled by your own voice, which will save your time and decrease your household burden considerably. High efficiency filters are in not only Roomba 980 but also Roomba i7. It is common that most products from iRobot are powered by Lithium ion battery that is famous for keeping the run time longer. Instead of thinking about when the battery run low and then have to be rush to recharge your cleaner, both products are going to automatically go to battery area. It is necessary for two models to spend approximately 3 hours for charging. The run time is the same with 2 hours. By going through the sameness, we feel like there is no strike distinction between these machines. However, Roomba 980 and Roomba i7 have differences that should be taken into consideration in case you want to buy the best proper product. Roomba 980 is designed with iAdapt 2.0. On the contrary, it is 3.0 version for Roomba i7. If we consider about the suction , perhaps Roomba i7 is better selection. In terms of this one, Roomba 980 has smaller battery compared to another one. Roomba i7 seems to be slightly smaller in comparison to Roomba 980. In addition to that, the innovative technology has made the collection bin in Roomba i7 become washable, which is unavailable on other models from iRobot. You will find next new feature in Roomba i7 that its notification has ability to tell you when is the beginning or ending of the cleaning process and tell you in case your machine is in trouble so that you can fix it then. Let’s look at the comparison chart for more specifications. Let’s move onto the strong points and the weak points as well of each product. What about real experiences with these devices? Good points: It can bring an amazing experience for its users after utilizing it from the first use. Small dimension helps it a lot in moving around the house without getting stuck even under furniture. By purchasing and using this product, you don’t have to worry that the house is too large for the machine to clean 100% your house. The most outstanding point in Roomba i7 when compared it to 980 model is that the customers can wash the bin. In addition to that, there are advanced features in terms of the bin together with the charging area that Roomba 980 has not been innovated until now. With 3.0 version for iAdapt in Roomba i7, navigating the entire house of the customers becomes smarter. You can command it by saying it to go to specific rooms that you want. Roomba i7 is said to give the best result on the carpets. Bad points: It is said by some users that for the real experience, the run time of Roomba decrease about a half of the advertised time. It can be caused partly by the very powerful suction. Besides, according to the specifications given by the manufacturer, the bumper of Roomba i7 is made by rubber. In contrast, it seems to be plastic. Good points: Many people feel high satisfaction with Roomba 980’s effectiveness. Pet hair and long hair which is pulled by it should be noticed. Besides, it is fairly easy to keep the product. Some customers regarded it as the greatest model compared to the previous ones. They also recommend this product because of being environment-friendly. Bad points: However, most products from any brands have its own limits. For this Roomba, it can be noisy. Especially when you are chatting with friends via phone, you may feel it a bit uncomfortable. You will see that it can get stuck and does not move sometimes while cleaning the house. And then you may have to restart it which seems that will take your time. 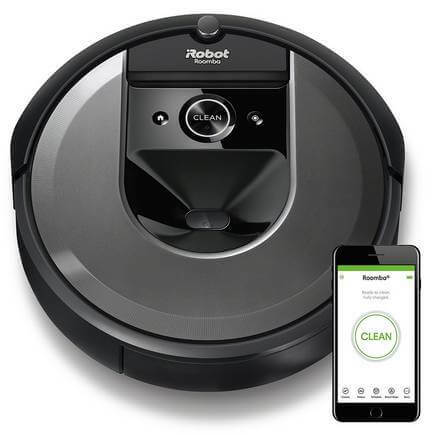 So, Roomba 980 or Roomba i7 is the perfect robotic vacuum cleaners? The answer is neither of them. Through the review, we can see there are not strong points but also limits in both of the products. So, what should we buy or which one is better? In my perspective, it depends on what you put above the others. For example, if you think that you are looking for more affordable device and don’t mind little noise sometimes, it is wiser for you to pick Roomba 980. Despite of the fact that it is more economical one compared to Roomba i7, it has most common functions as Roomba i7. However, if you are trying to look for a model with advanced technology and your house’s floor are hardwood, you can experience Roomba i7. Through this review, I hope that you can find useful information that partly meets your requirement. By the article, you can make a wise decision in case you are going to purchase a robotic vacuum cleaner. 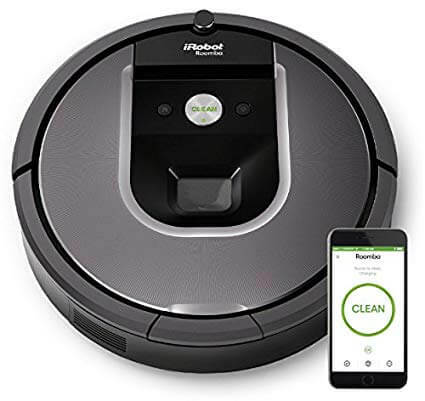 If you find out this is either of these vacuums that you’re looking for and want to find out more information about them, you can buy Roomba i7 or Roomba 980 here.